You wouldn't think that a single brick would change the course of human events. Or a single block of concrete. But if you're thinking about how to make homes safer from earthquakes, a single brick or block can be the difference between life and death. Dr. Elizabeth Hausler, founder of Build Change, has put a lot of thought into bricks and concrete as lifesaving materials. Elizabeth has an armload of degrees in engineering and she really understands how to make a good brick and a good concrete block. She's taking that knowledge around the world, to China, Haiti and Indonesia and she's using it to save lives. When the Twin Towers fell on 9/11, Elizabeth realized she had to do something meaningful with her engineering savvy. "When I was watching the events unfold on September 11th, I just felt really compelled to use my engineering skills to benefit humanity," she told me in an interview. On September 11 it so happened that she was trying to decide about applying for a Fulbright fellowship -- the deadline was upon her -- but the events of 9/11 focused her resolve. She applied. She got the fellowship. Then she traveled to India in 2002-2003 to learn what made one house earthquake-resistant while another fell. It was on that trip that she formulated the best ways to rebuild safer after a disaster and -- most importantly -- put long term change in place. She called her program Build Change, and she has since taken it to China, Haiti, and Indonesia and helped thousands of homeowners create homes that are earthquake resistant. You want to know the secret to a seismically-safer house? Elizabeth learned that homeowners, builders and government officials needed to know more about the materials they were using. You could say they just needed to know how to make a better brick. It doesn't sound revolutionary, but when you change construction practices you change a culture, and you also create opportunities for people to make money and shelter themselves. "We start out doing forensic engineering. Basically, after an earthquake, there are so many lessons that you can learn, just by looking at the buildings that collapsed and the buildings that didn't," Elizabeth said. After she gathers this evidence she does something that more NGOs and aid groups are learning how to do. She listens. "Usually there's some expertise within the country about how to build an earthquake-resistant house," she told me. By talking to residents she can understand why the buildings collapsed and what local people can do to make new construction better. She's traveled the world to study the aftereffects of nine different earthquakes and "we see the reasons why buildings collapse in these kind of environments and the reasons why they stand up are pretty much the same in every place where we work." She's turned those reasons into a curriculum that can be taught to local engineers, builders and homeowners. A simple, symmetric layout for the home, strong connections between the building's elements, good bricks that are fully-fired and strong, and concrete that has enough cement in it and has been properly cured. Basic stuff. The genius in the method: It is teachable. "For example, in Haiti right now we have 42 Haitian engineers, architects and other construction professionals on our team who we've trained in the basics of earthquake-resistant design and construction, and now they go out and do training programs for us. We're trying to empower Haitian engineers to really drive the process themselves," Elizabeth said. Build Change doesn't need to bring in new technology or new materials, because people would be less familiar with them and, anyway, they wouldn't be available in local shops. Instead, Build Change makes small, significant changes to existing building methods. In Indonesia, it was as simple as soaking the bricks in water before using them. That easy step strengthens the bond between bricks and mortar, which strengthens the entire wall. 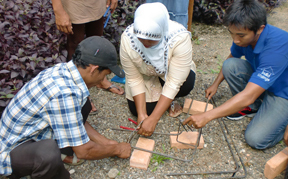 Making local construction methods and materials affordable also makes them adoptable by local people. No matter how smart your design idea is, its meaningless unless it can compete in local markets and people use it. Build Change has posted some impressive numbers: more than 18,350 safer houses, more than 2,800 builders educated through on-the-job training, and more than 3,000 engineers who know how to make a better brick, a solid concrete block, and a safer house. Hear Elizabeth tell more about her story in the be global podcast. Learn more about Build Change online. The organization is raising money to continue rebuilding in Haiti and you can use the Universal Giving Website to donate. All images courtesy Build Change.